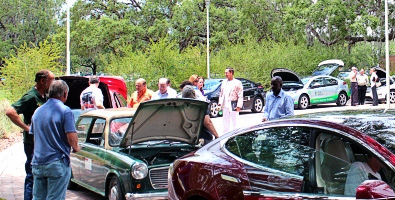 On May 31, the Patel College of Global Sustainability held a joint meeting of the Suncoast and Central Florida Electric Vehicle Associations in conjunction with the Sierra Club as part of its Tampa Bay Clean Cities Coalition (TBCCC) programs. The event kicked off in the USF Patel Center driveway with an electric vehicle display and driver meet-and-greet, giving participants the opportunity to get first-hand accounts of owning an EV. Several TBCCC members displayed their electric vehicles including Margaret Rush from EPC Hillsborough County, Juan Reina from TECO, Mike Malley from Duke Energy and Helda Rodriguez of NovaCharge. Two Tesla models, a Model S and a Roadster, were highlights of the show, as the 2013 Motor Trend Car of the Year was awarded to Tesla’s Model S. Also on display were two cars converted to EVs, one of which was a 1967 Austin. Next, the event moved inside the Patel Center for expert presentations on electric vehicles moderated by USF’s Steve Reich, TBCCC coordinator. The program began with remarks on the electric vehicle ownership experience by Al Lococo of the Central Florida Electric Vehicle Association. The program continued with the Patel College’s Dr. Jochen Eckart focusing on how to provide a clean, healthy and livable region through the work of the TBCCC and concluded by inviting participants to join the coalition. The Sierra Club’s Britten Cleveland picked up on the importance of collaboration to affect policy on the local and national levels. Ms. Cleveland, who runs the Florida Healthy Air Campaign aimed at reducing dependence on fossil fuels, presented compelling evidence on the direct role electric vehicles can have in drastically improving the environment in the U.S. After some debate and input from the audience on the trajectory of EV sales, it was determined President Obama’s goal of having one million EVs on the road by 2015 can be achieved. Article and photo courtesy of USF.